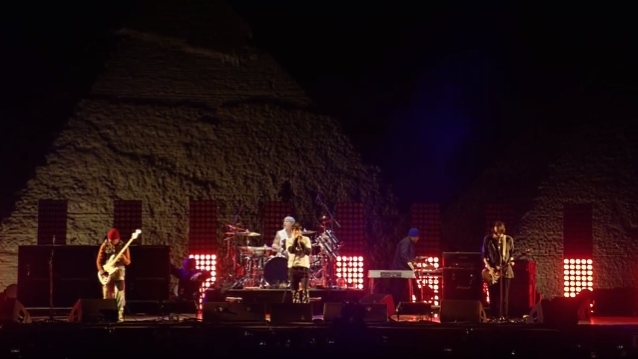 Earlier today (Friday, March 15), Nugs.net, the leading live music distribution platform for concert recordings and live streams, offered a free live stream of the RED HOT CHILI PEPPERS playing live from Egypt's Pyramids of Giza. This was the first time any event has been live streamed from the last-standing wonder of the ancient world. 7 Cinematics CEO Adam Paul added: "To us, this is the Super Bowl, the biggest of the big. We have trained, prepared and dreamed of an event of this magnitude for decades. It is our time and we are ready. We are truly humbled and honored to be able to show our talents on the world stage." The concert was filmed in 4K by 7 Cinematics, directed by George Elizondo, and live streamed in FullHD via Nugs.net to the band's social media channels where fans can watch live for free. 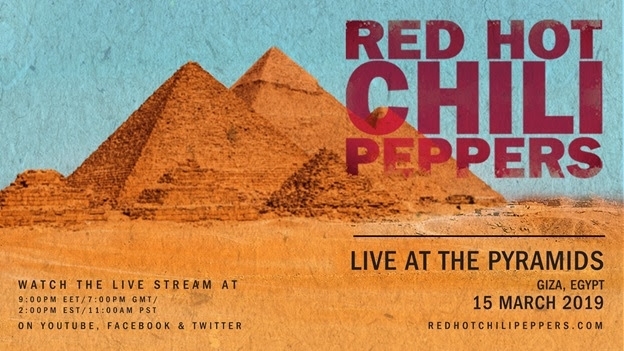 The audio recording of the show will be released at LiveChiliPeppers.com in multiple download formats ranging from MP3 to hi-resolution audio.